We all have experienced the ups and downs of life, and yes we have all lived through periods of feeling entirely down and out. The blues have hit us all, but this cannot be said to hold true for those of us battling the debilitating effect of depression as their life is then wholly held to ransom by depression. Depression is simple terms is a fairly common disorder and is also a serious condition as it affects every aspect of your life right from how you think about how you react to situations. Depression rules the way you live, eat, sleep everything. One must feel low and out for at least two weeks to get a diagnosis done. Do not make the cardinal mistake of thinking that all kinds of depressions are the same; some may happen due to exceptional circumstances. Postpartum depression: do not make the mistake of just brushing this severe depression under the ‘Just Baby Blues- which are mild depressive symptoms which clear of within 2-3 weeks’. Women who have this form of depression suffer from major symptoms(full-blown) of depression during the pregnancy period as well as after the birth of the child. These women experience the entire gamut of extreme sadness, tiredness, exhaustion and even find it difficult to manage daily chores like looking after their babies and themselves. Psychotic Depression-when depression is combined with some form of psychosis. A person with this form builds around delusions and make believe things which others are not able to see or hear(hallucinations) These people develop delusions of extreme guilt, poverty and even illness. Seasonal Effective Disorder- this is as the name suggests is related to the weather especially the winters when the days appear dull due to lack or absence of sunlight. The good news is that this blue mood leaves us with the arrival of spring. It is not necessary that you would experience all the symptoms and signs and these can vary from person to person. What we all need to remember is that ‘one shoe fits all’ cannot be used for depression as each experiencing depression goes through a different gamut of experiences and feelings. 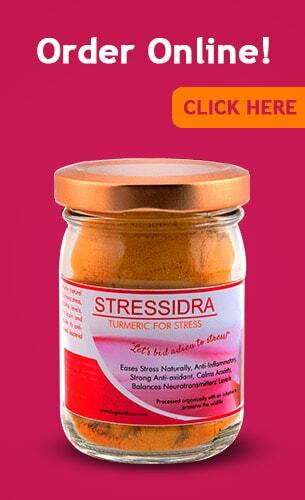 The one thing that works for all people is Stressidra from Bagdara farms. Curcumin with its powerful anti-inflammation checks chronic inflammation and helps relieve symptoms of depression. A study published in the Journal of Affective Disorders in October 2014, researchers from several universities from all around Australia worked with 56 patients. These patients had MDD, and one group was given curcumin while the other was given placebo capsules twice a day for eight weeks .each group showed similar improvement in scores till the fourth week but from then on the group taking curcumin showed relatively greater improvement especially those with atypical depression. Curcumin enhances the production of glutathione which is anti-oxidant and is necessary for the health of your brain. Curcumin is useful in balancing the levels of serotonin, dopamine, glutamate and noradrenaline all of which helps in keeping one in an upbeat mood. Curcumin helps enhance the BDNF( Brain-derived neurotrophic factor) which helps in checking inflammation and also works wonders in boosting focus and cognitive abilities. Curcumin helps check tissue damage brought on by lipid peroxidation and also the level of antioxidant enzymes. The anti-inflammatory property of Curcumin inhibits and checks the action of pro-inflammatory chemicals like interleukin and prostaglandin. The same action also checks the activity of cyclooxygenase enzymes and nuclear factor kappa b.
Owing to the efficacious effect of curcumin in Stressidra controls anxiety-like symptoms which are quite common in depression. Thus providing the perfect foil for anxiety, depression mood swings without any side-effects (most over the counter medications cause weight gain). With Stressidra you are armed to beat the depression blues without fear of any side-effects.